Click to Download Simplified Schedule here. 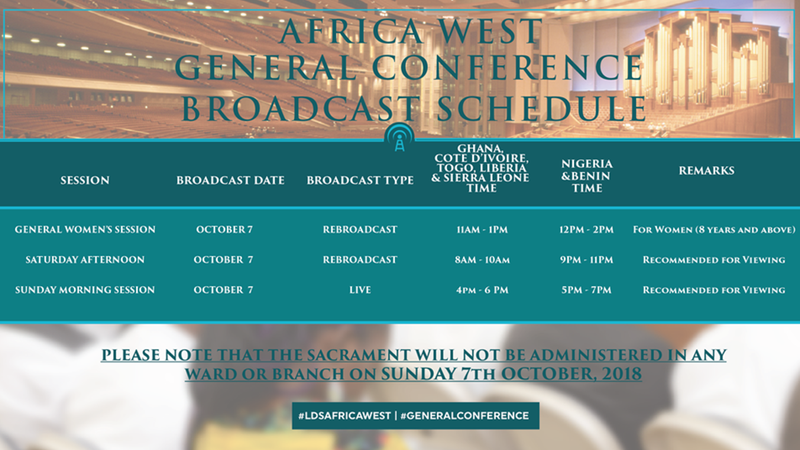 Again, for this upcoming October 2018 General Conference, a General Conference session will be beamed live via satellite to stake and district centres in the Africa West Area. Other sessions will be available by rebroadcast just a matter of hours after they have taken place. As a result, Sunday, October 7th, 2018 will be the day when all wards and branches will view a session of the General Conference instead of holding a Sacrament service and Sunday lessons. From 9 am to 11 am on Sunday, October 7th, all wards, and branches in these countries will receive the Saturday afternoon session of the General Conference in their stake or district centre. Sisters are invited to then remain to view the Women’s session of the Conference from noon to 2 pm. The Sunday morning session will be broadcast live at 5 pm. From 8am to 10am on Sunday, October 7th, all wards, and branches in these countries will receive the Saturday afternoon session of the General Conference in their stake or district centre. Sisters are invited to then remain to view the Women’s session of the Conference from 11 am to 1 pm. The Sunday morning session will be broadcast live at 4 pm. Please note that the sacrament will not be administered in any wards or branches on Sunday, October 7th, 2018, except for those not able to receive the broadcasts. For remote branches where members cannot attend the district centre, and for branches outside mission districts, leaders should set aside Sunday, November 11th to view the General Conference DVD which will be sent.